What’s an appropriate punishment for destroying 33,000 acres of forest? The smoke hasn’t cleared and the Eagle Creek fire rages on, but as more details come out about the 15-year-old Vancouver boy suspected to have started the Eagle Creek Fire by throwing smoke bombs, we wonder – what is an appropriate punishment for destruction of this scale? Details continue to emerge about the boy, or group of teens, allegedly responsible for igniting the top priority forest fire in the United States. Liz Fitzgerald, a Portland resident, was walking along a trail in the Columbia River Gorge and ran across a 15-year-old throwing smoke bombs into Eagle Creek Canyon. When she approached the teenager and his friends, they were allegedly giggling about their antics. Fitzgerald spoke with the teens and pointed out how dangerous throwing smoke bombs in a forest could be. The teens’ response? No remorse. An act of domestic terrorism. The destruction of more than 33,000 acres of public grounds combined with endangering hundreds of human lives and causing millions of dollars of property damage along with the millions it will cost to fight the fire certainly constitutes domestic terrorism. Past cases of wildfire punishments include fines and jail time with the most notable recent occurrence involving an Oregon rancher paying a $1 million fine in 2014. However, there is no past case precedence like this. 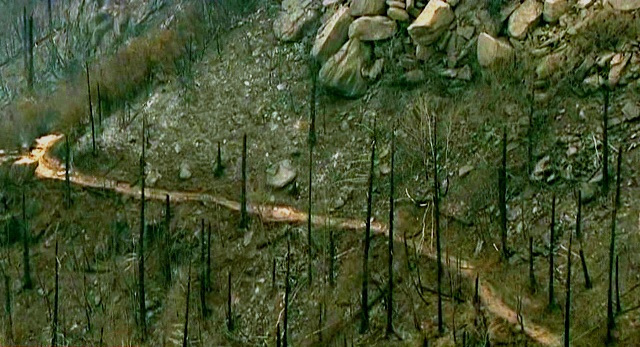 The $1 million fine was punishment for a rancher who lit a 2,700-acre wildfire. Although the court ordered he pay $3.6 million in fire suppression costs, his insurance company settled the case for $1 million. What should the punishment be for a fire more than ten times the size of the 2014 Grant County 2,700-acre fire? Fireworks are Weapons of Mass Destruction. A handful of smoke bombs caused a 33,000-acre fire burning more than 50 square miles, causing significant property damage, endangering hundreds of human lives, killing wildlife, and damaging the local ecosystem along with the tourism economy for the area. The health effects of smoke inhalation on the millions of residents in Oregon and Washington are still being quantified. If this kind of event doesn’t classify fireworks as weapons of mass destruction – weapons that can cause great damage to the biosphere – we’re not sure what does. The 15-year-old suspect from Vancouver, Washington allegedly ignited a massive forest fire with a few dollars worth of fireworks. The irony that the City of Vancouver just banned all fireworks sales and use in October 2016 is not lost on us. Unfortunately, much of the Vancouver area’s more than 450,000 residents do not live within the city limits (less than 162,000 reside in Vancouver proper), they live in unincorporated Vancouver and Clark County where fireworks sales are still permitted, and Washington State holds some of the most lenient fireworks regulations of any state in the country. In a perfect world, we should be able to do whatever we want. Anyone who wants to use fireworks should be able to do so and this tragedy should not limit access to them. However, we don’t live in a perfect world. We live in one with finite resources and a population surpassing 7.5 billion people. The actions of one individual can impact millions for years. The consequences of this 15-year-old’s actions will certainly be felt in the Pacific Northwest for decades to come. If one sociopath can wreak devastation and destruction on such an epic scale affecting millions of people with easily-attainable and inexpensive products intended solely for entertainment purposes and no other use, we believe it’s time, as a society, that we agree that fireworks should be left to the professionals and personal consumers no longer need access to them. It’s time for the legislatures of Oregon and Washington to completely eliminate the sales and use of all fireworks to personal consumers. Stumped in Stumptown on Twitter (@StumpedInPDX) has started using the hashtags #BanAllFireworksSales and #BAFS to denote our stance toward banning fireworks sales in Oregon and Washington. We have compiled a list with accompanying contact information for Clark County and Skamania County state representatives in Washington along with contact information for the Oregon and Washington governors at the bottom of our ongoing coverage of the Eagle Creek Fire should you want to contact either state’s leadership to let them know your thoughts. This topic has the potential for vigorous debate, and, at Stumped in Stumptown, we welcome and encourage the sharing of insightful perspective. What punishment is sufficient? Should personal consumers still have the right to buy fireworks? Feel free to leave your opinions in the comments. Please note, as always, comments with unfounded accusations and unsubstantiated statistics will not be approved. While powerful opinions are always welcomed, lies are not.